Designed for placing on the kitchen counter. 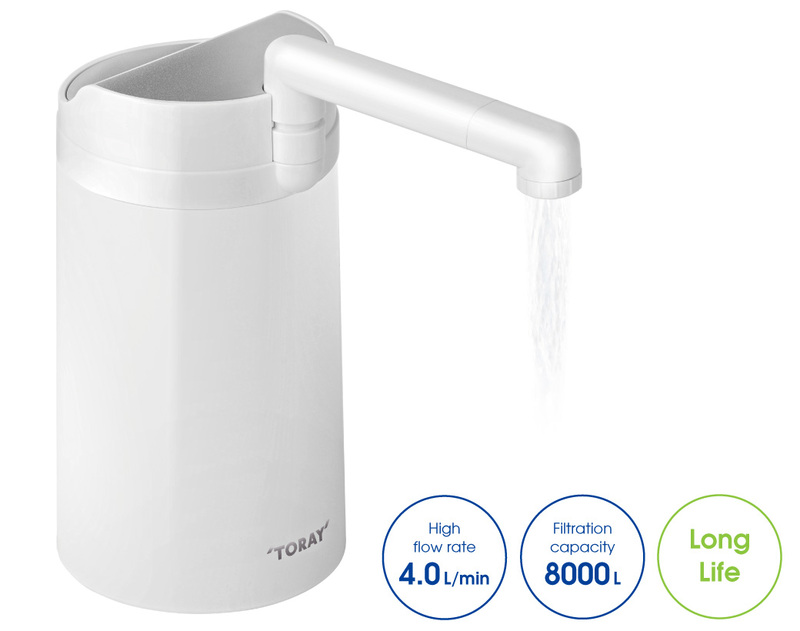 Long-lasting filter cartridge suitable for using larger amount of clean water. Coral powder The use of activated coral powder, which is made from natural coral, adds healthy minerals. 360-degree rotation! 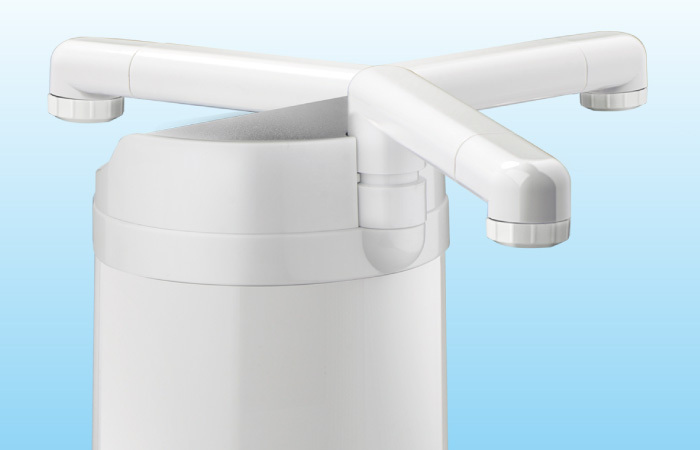 The long nozzle for filtered water extending from the filter body is easy to use also in a narrow kitchen, and its 360-degree rotation makes the purifier suitable for any kitchen. The long nozzle can be folded when not in use. *Removal element differs depending on products. The secret to delicious water is our special cartridge construction, which features “four-stage filtering system” that takes water taste and quality to the next level. High performance filtration - coral powder combination makes water convincingly delicious! Our counter top filters use the four-stage filtering system that uses both granular activated carbon and a multilayered hollow fiber membrane filter. This system effectively removes residual chlorine as well as turbidities, red rust, coli and other bacteria and cycts, leaving minerals essential to the human body as calcium or magnesium. In addition, the use of activated coral powder (which is made from natural coral) adds healthy minerals. Long-lasting filter cartridge is good for an entire year! The long-life filter cartridge used in our counter top products is both convenient and economical, lasting about a year in households that use as much as 20L of purified water per day. 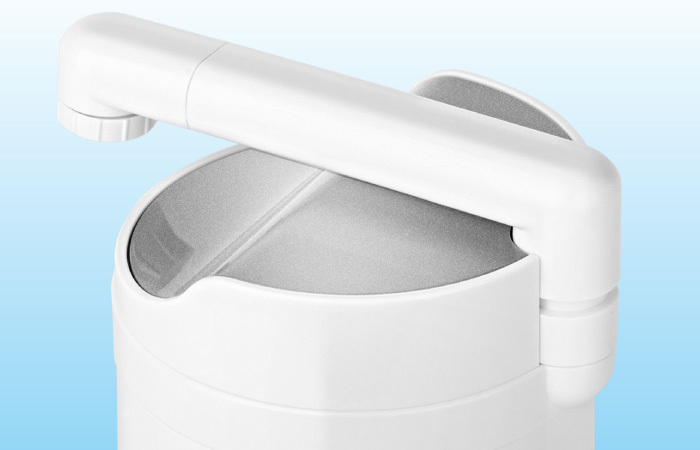 *1 Experimental results shows that the unit removes 99.99% of bacteria, meeting the Japan Water Puridier Association (JWPA) Volantary Standards "B.200 Standarad for Removal Performance of Water Purifiers (Bacteria Removal Performance Test)". *2 Water quality and regional/usage conditions may shorten the life of the filter cartridge.